NUarts Gallery is excited to present for the month of August “VAPOUR” a collection of oil paintings by NUarts artist Joanie Ciolfi. This exhibit runs from August 2nd – August 31st with an opening reception as part of First Friday’s Artswalk from 5- 8pm. A Berkshire County native, painter and artist Joan Palano Ciolfi draws inspiration for her work from everyday objects and abstract forms in nature that combine luminosity, transparency and expressive movement. Trained in fine arts and graphic design Joanie has developed a unique style that incorporates both structured elements and abstract freedom. Through the use of oil sticks, oil paints and brushes Joanie transforms her canvases into atmospheric paintings that are saturated in color. In this exhibit, she found her guiding light in the intensified hues of the local landscape throughout the course of periodic precipitation. Joanie received a BFA in Visual Design from UMass Dartmouth where she trained in fine arts and graphic design. She has worked as a textile and wall-covering designer for numerous national brands and as a freelance artist for clients throughout the northeast. Her work has been featured in national publications including Better Homes and Gardens. 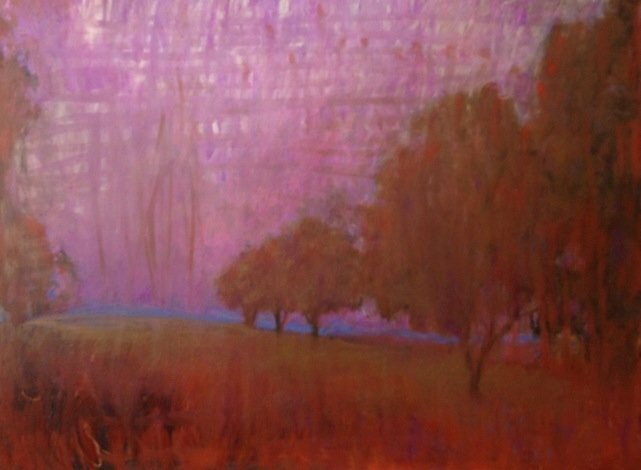 Joanie has enjoyed solo exhibits in Cambridge, MA and throughout Berkshire County. Her work has been shown in galleries and group exhibits throughout New England and New York. 01 Aug	This entry was written by nuartspittsfield and published on August 1, 2013 at 10:42 pm. It’s filed under exhibit and tagged ciolfi, painting, vapour. Bookmark the permalink. Follow any comments here with the RSS feed for this post.